Since time immemorial, the nomadic life in Dzogchen as in numerous other Himalayan regions has followed the rhythm of the seasons, in complex and ceaseless interaction with the natural environment and the deities. The nomad’s ancestral knowledge of his surroundings, passed on from generation to generation, enables him to survive in one of the planet’s least hospitable regions. 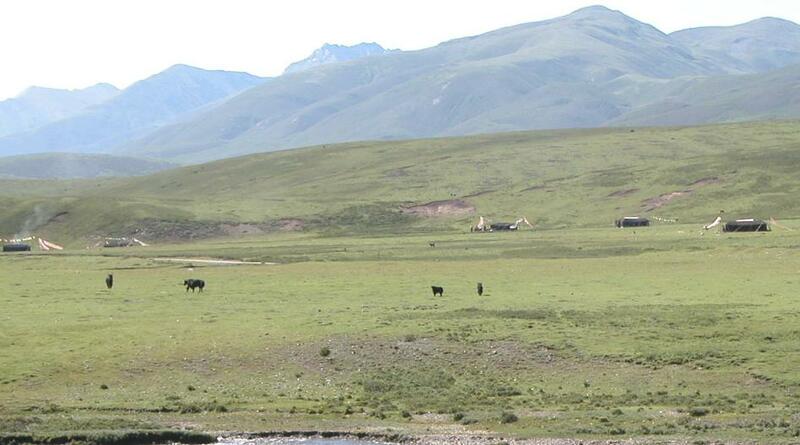 Tibetan nomads have done more than survive, however. They have developed a unique culture that fascinates and inspires all who are fortunate enough to come into contact with it. Nomads generally live in groups of 10 to 25 families, each occupying a yak-hair tent and owning one or more clay, wooden or stone houses, depending on the region. The houses are lived in during the cold season, the tents when the weather becomes milder. The tents are put up at quite a distance from each other, ensuring that each family has enough grounds to graze its herds of yaks, goats and sheep. Inside the tent, adults and children each have their own living space but gather around the central open fire in the middle of the tent. Fuelled with yak dung and juniper branches, the fire sends its heating and cooking smoke up and out through an opening in the highest part of the tent. A small altar is dedicated to Buddhist deities and protector gods. Other indispensible elements in the nomad’s tent include a box for valuables, a cooker and kitchen utensils, and sheepskin or yak hair rugs and blankets, all guarded by ferocious watchdogs leashed up during the day but running free at night. Most nomads only live the nomadic life in spring, when mountain pastures are bountiful. Spring is the season for business dealings with the sedentary population, trading yak wool or butter for foods not available locally like cereals, fruit, salt and tea. Then, with the arrival of the great colds and snows, the nomads move to their winter quarters in the valleys, living in houses of their own construction. More and more nomads are getting access to electricity, often through small power generators or solar panels. Some families value their children’s educations and join in hiring a tutor, often a monk or nun from among the relatives, who teaches the children to read and write. Other families send their young ones to the monastery. Yet other children grow up learning the nomad-shepherd trade but remain illiterate. No one knows how long this way of life will be able to continue, even though it is an essential element of Tibetan identity. It is a primary goal of the Dzogchen school to make youngsters aware just how important but at the same time fragile their culture really is, and to offer them ways to contribute to its safeguarding through programmes of literacy and education. Around Dzogchen, the nomad population is organized in a dozen nomad “villages”, family groups living close together, sharing resources and moving together as the seasons change. Each village has a council, headed by the village leader, which makes the important decisions affecting the community.